Delicious, cheesy and low in calories, this dish is a game changer. By omitting a few ingredients and tweaking the prep method, I’ve managed to dramatically cut back on calories, carbs, fat and salt without sacrificing any of the rich, Italian flavors. Go ahead and whip up a batch for dinner—or for an upcoming party appetizer—and I guarantee you will make it again and again. Preheat the oven to 400°. Liberally coat a baking sheet with nonstick oil spray and set aside. Cut off and discard both ends of the eggplant and then slice the eggplant into rounds. 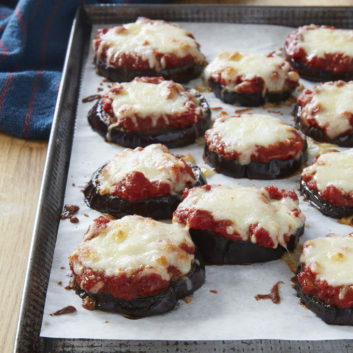 Arrange the eggplant slices in a single layer on the baking sheet. Mist the tops of the eggplant slices liberally with oil spray, and lightly sprinkle with salt and pepper. Bake for 20 minutes, or until eggplant is soft and golden brown. Top each slice with about 1 tablespoon marinara sauce and 1 heaping tablespoon mozzarella cheese. Sprinkle the slices with the Parmesan cheese, oregano and red pepper flakes. Bake for another 5 to 10 minutes, or until the cheese is hot and bubbly. For more healthy recipes, follow Joy on Instagram, Twitter, Facebook and Pinterest.